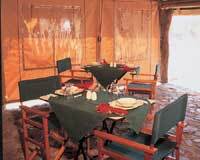 The accommodation at Tsoma is five charming wooden chalets on stilts - each with two beds and a quaint verandah. Each chalet has its own barbeque, whilst the communal lapa and braai area is fully equipped with stove, electric fridge and freezer as well as the usual kitchen crockery and utensils. 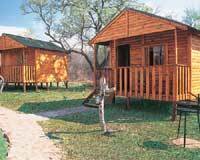 The camp is fully serviced, towels and linen are provided and an immaculate ablution facility offers excellent shower facilities. For those visitors to the Ikhutseng Nature Reserve who prefer a more casual, self-catering experience, Tsoma Camp is the answer. organised hikes accompanied by a trained game ranger. Walking boots. Wood, charcoal and ice available to purchase. - Remember you are in the wild! Normal safety precautions must prevail. - No private vehicles allowed to drive on reserve except during arrival and departure. Cars parked at designated area. - Check-out time: 10h00. According to availability, late check-out can be accommodated. - Refuse bins are provided. Please do not litter! 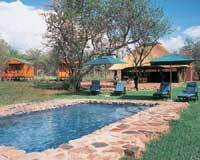 - Smoking is not allowed in the chalets or on game drives. In other areas extra care must be taken due to high fire risk. Make sure all cigarettes are extinguished properly. - Misconduct or misbehavior can lead to immediate eviction.